A new wine bar and breakfast and brunch spot has opened for business in the neighborhood. Located at 764 10th Ave. (between 51st & 52nd streets) in Hell's Kitchen, the fresh arrival is called Decimo Ristobar. This new spot--whose owners describe themselves as "bowtie-wearing badasses"--features an all-day brunch, dinner and dessert menu inspired by Italian cuisine. sauce and ground beef; crespelle, Italian crepes with a choice of filling like Nutella or fresh berries; and a panini with apples, brie, fig, and San Daniele prosciutto on focaccia. There's a variety of coffee standbys, too, like cappuccino and macchiato. Switching over to dinner, look for entrees like warm grilled octopus with celery and fennel over red potato salad and whipped cream; grilled lamb chops in balsamic vinegar over rosemary roasted potatoes; and pasta dishes like linguine and clams with garlic and parsley in white wine sauce. With a 3.5-star rating out of eight reviews on Yelp so far, the newcomer has made a promising start. 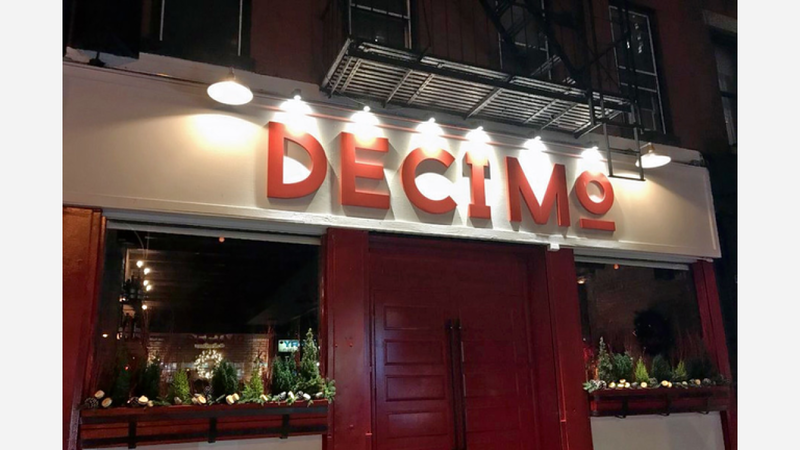 Ian D., who was among the first Yelpers to review the new spot on December 21st, said: "Decimo is the perfect spot to have an intimate date night or even a large gathering. The wine selection is wonderful and very reasonably priced, and the food is top notch." Yelper James W. added: "Wasn't in the mood for anything heavy, so went for the Bruschetta Funghi. Very good...looking forward to hearing more about this place. Worth a try, but lots of competition with Italian in the neighborhood." And Jorgie C. said: "Great pasta , cute vibe. Good service , staff is very pleasant. I wish this place all the luck! Highly recommend for a quick bite with no fuss."